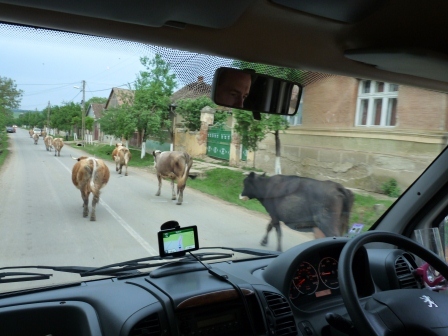 We approached the Romanian frontier at a small crossing in the east of Hungary. Ours was the only car visible as we approached the remote border post in the dusk of late afternoon. A man in a green uniform was smoking and put his cigarette down on the curb as we approached. The country of registration of most European vehicles is indicated on the license plate, so it was obvious that we weren’t from around here. Two other men in green appeared. They flipped through our passports and our vehicle registration. One asked, in surprisingly good English, “Do you have any special baggages?” I wasn’t quite sure what he meant or how to answer so I smiled, shook my head, and said, “Nothing special”. They were handing us back our passports and the English speaker said, “Enjoy your stay in Romania”, when he noticed that we were from Canada. Up to this point they had assumed that we, like our camper van, were from England. This was apparently an issue. All three men disappeared for a very long time. We sat there with the engine off, waiting. Ours was the only vehicle there. We could hear the crickets chirping, but after what seemed like an eternity, they re-appeared with our passports and let us pass. The English speaker said, “Welcome to Romania”. Romania recently joined the European Union, but it is not yet part of the Schengen Area, the zone of 26 European countries that share a common customs and immigration boundary. So we needed to receive passport stamps to leave the Schengen and to enter Romania. I don’t think that many Canadians pass through this lonely border crossing. I am thankful yet again for the fact that Canadians are welcomed into so many countries. We bear one of the best passports for international travel. 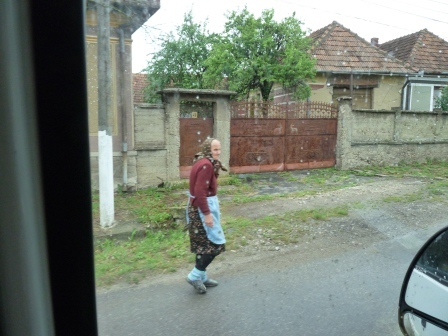 As soon as we arrived in the first Romanian village we noticed a big difference from Hungary. Things were visibly poorer and less developed. The roads were paved, but full of holes or patched and bumpy. The few cars we saw were small, old, and in poor condition. There were as many horse-drawn wagons on the road as cars. We passed a man using a pitchfork to load his wagon with fresh grass cut from the roadside using a scythe. It felt like we had gone back about a hundred years. The houses were simple and some had outbuildings made of wattle-and-daub. There were open ditches in town and no sidewalks or landscaping. The ground in front of the small homes was just mud. The children were playing in the street. A popular toy for the boys appeared to be a whip. Definitely not child safe. The few adults we saw had dark, weathered complexions. Some women sat in front of their homes wearing kerchiefs and house smocks. Several times we had to slow to pass small herds of cattle in the streets as they were being brought in from the fields. Each group was being prodded by a man with a whip, usually accompanied by a boy. As we passed, everyone stared at us. It felt like we had been teleported back to a village in (rural Africa, India, or Nepal). Suddenly we were curiosities again, instantly recognizable as being outsiders. I had expected to encounter this somewhere in Central/Eastern Europe, thinking perhaps it might have occurred earlier in Poland or Hungary, but they were both more developed and more frequented by tourists. 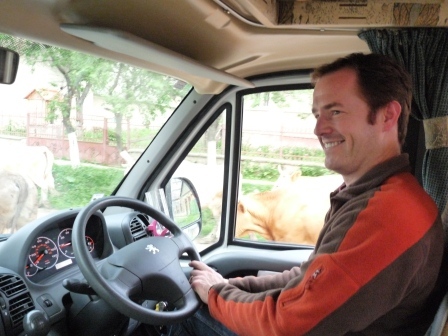 In rural Romania our large vehicle and our light skin colour make us stand out. There were not many shops and none were open. Eventually we arrived at a gas station, hoping to buy a vignette. There were no cars there, but there was a person filling plastic containers with fuel. They didn’t sell vignettes. Surprisingly, we did find a bank machine and were able to get some Romanian lei (pronounced ‘lay’). I had to walk through the mud to get to it. We headed for the only campground in this part of the country. It is operated by a non-profit foundation led by a Dutch couple that takes in battered women and their families. They are glad to see us and asked about our journey, seeming almost surprised that we had made it. There is only 1 other camper here. 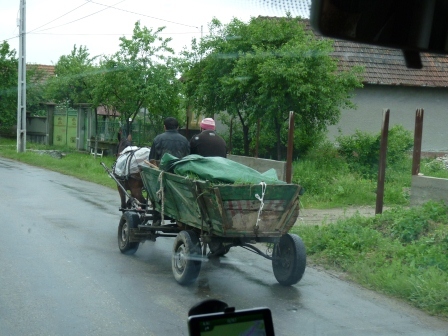 This entry was posted in Europe, Travel and tagged arrival, border, cows, EU, Europe, European Union, horse, Romania, rural, travel, village, wagon on June 5, 2012 by dreambigliveboldly.